drug metabolites remain stored in fatty tissues for years. That accumulated drug residues continue to cause adverse symptoms led L. Ron Hubbard to develop a program aimed at reducing levels of toxins in the body to assist in recovery. 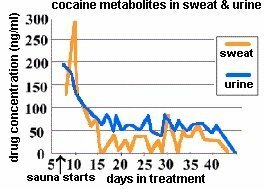 The graph depicts cocaine metabolites being excreted in the sweat and urine of clients participating in the Narconon New Life Detoxification Program. Levels of drug metabolites are not detectable in clients prior to the start of this program, then increase dramatically and slowly taper off as the program is continued. This supports the argument that drug residues remain in the fatty tissues and that the correct treatment can mobilize and remove them through the body�s excretory systems. 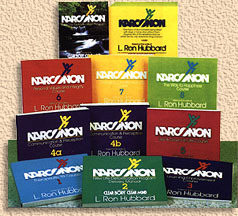 The Narconon� program, first established in 1966, is unique. It is a proven get off and stay off drugs program. In addition to becoming drug-free, a Narconon graduate knows how to communicate, live a clean and ethical life, help others and contribute considerably to his family, friends and society at large. DRUG-FREE WITHDRAWAL This first step of the program assists the individual to cease current drug use rapidly and with minimal discomfort through proper nutrition, vitamins and care from experienced Narconon staff. THE COMMUNICATIONS COURSE Therapeutic TRs Course extroverts the student and gets him into better communication with others and with the environment. There are eight training routines on this course (called �TRs�). Each is a specific drill on the parts of communication and how to get oneself understood and how to communicate with others. THE NARCONON NEW LIFE DETOXIFICATION PROCEDURE - This step of the program removes drug residues and other toxic substances from the body. These residues remain locked in fatty tissues of the body and can be released into the blood stream years after the person has stopped taking drugs. The residuals can cause cravings for more drugs and thus need to be eliminated from the body which is accomplished through an exact regimen of exercise, sauna and nutritional supplements, ridding the fatty tissues in the body of drug residues. THE LEARNING IMPROVEMENT COURSE gives the student the ability to study and retain knowledge along with the ability to recognize and overcome barriers to study and learning. The student learns data on the three barriers to study. He learns how to clear a word in a dictionary so that it is fully understood, how to do demonstrations of concepts so he can easily grasp them and how to spot and handle any difficulties in his study. THE COMMUNICATION & PERCEPTION COURSE gives the student the ability to get into full communication with others and his environment. The student really polishes up his communication skills by redoing the eight Training Routines and then does a series of new exercises which fully extroverts the student and gets his attention off of himself and onto the environment. This greatly raises perception and ability to handle the environment and control his life. THE UPS AND DOWNS IN LIFE COURSE gives the student the ability to spot and handle those influences in his environment that would cause him to lose any gains he has made. This ethics technology was developed by L. Ron Hubbard and covers exactly how to apply these steps to improve conditions in life. It also teaches the student how to repair previous bad conditions and how he can apply this technology and keep winning. "THE WAY TO HAPPINESS" COURSE teaches the student a non-sectarian moral code which is a guide to living a happy life based on the book The Way to Happiness��.